The Dynamelt™ system provides accurate, proportionate temperature control for the hopper, hoses and applicators. Sequential heating delays may be programmed for turn-on of the hoses and heads. A "standby" temperature may be programmed so that the temperature zones can be maintained at a lower temperature when the hot melt adhesive supply unit is not in active use, enabling rapid return to normal operation. The next generation Dynamelt™ S defines a new standard of innovation in the industry. 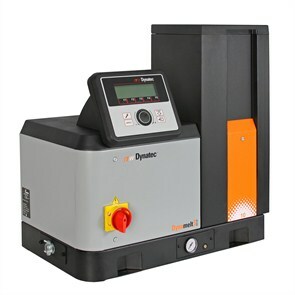 With intuitive controls and a modular design that make it simple to install, operate and maintain, the Dynamelt™ S is the go-to choice for manufacturers worldwide. Unique design and performance features set it apart from the competition, minimizing downtime and offering greater flexibility. Designed to be used in conjunction with the Dynatec family of equipment for maximum efficiency and performance, this virtually "invisible" system will remain in sight but out of mind in your facility. Simplified access and maintenance procedures make replacing modular electronics, filters and pumps quick and easy. Intuitive, easy to read display is repositionable to front or side of unit and shows all system parameters at a glance. Consumes up to 20% less energy and significantly less air than similar competitive units, reducing operating costs. New Nano ceramic hopper coating is 5 times more durable than competitive PTFE coatings to withstand wear. Standard features include 7-Day Scheduler and adhesive level sensor to simplify daily operation.